Russia’s economy should enter a new phase in 2013 — the country begins its first full year as a member of the World Trade Organization (WTO) and has plans to pursue further modernization policies. How the new year will play out, however, depends largely on how the government responds to the changing demands of the global economy. At the height of the 2008 financial crisis, many observers believed Russia was destined to be trapped in a boom-bust cycle. Memories of the 1998 economic crash had not yet completely faded when the 2008 financial crisis hit, and experts widely believed its effects would be far worse. Although the crises were different in substance, it was not difficult to question the ability of a commodities-based economy lacking diverse financial markets to resurrect itself for the second time in less than 10 years. Today, however, the situation looks very different. Economies around the world, including those of China and the United States, are either slowing down or remain in a state of stagnation, and while Russia’s economy has also experienced a cool-down of its own since the second quarter of 2012, it has done so in the most orderly fashion. Russia learned many lessons from 1998, and in the 10 years between that crisis and the next one, the government put into place the right instruments and policies to prevent another crash of the same scale. For one thing, the Russian Central Bank established a more robust monetary policy, which allowed for exchange rate flexibility. The boom-bust experiences of the 1990s and 2000s stemmed from either de jure (1998) or de facto (2008) fixed exchange rates of the ruble. To combat against the 2008 crisis, the Russian Central Bank induced significant stress tests for domestic liquidity conditions, and, hence, sudden stops in local credit. By now, though, these changes are ancient history. 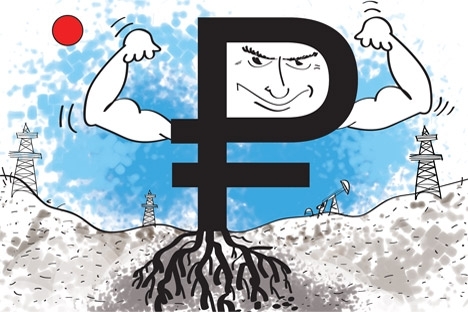 Starting from 2010, the Russian Central Bank demonstrated an increasing level of latitude toward the scale of currency fluctuations, so even if external economic conditions worsen sharply, as some analysts fear may happen in 2013, the depreciation of the ruble would act as a buffer to the real variables. And while some of this shock, were it to happen, will still be felt in Russia (especially since 75 percent of the country’s exports are commodities), the consequences for the economy as a whole would be much milder than past experience suggests. Russia’s GDP for 2013 is currently expected to be in the range of 2–2.5 percent. Inflation, which inched higher early in 2012, has showed some signs in recent weeks of rolling over yet again. If this is the case, then the Russian Central Bank could consider easing monetary policy in the spring, or even earlier. Such easing would be possible even as the Central Bank strives to bring Consumer Price Index inflation down to 5–6 percent range. By the end of 2013, economic growth would most likely have expanded to 3.5–4 percent, which is widely seen by analysts as the proper estimate for Russia’s current long-term growth potential. The crucial question is whether Russia is capable of attaining an even higher growth rate. Russia’s economy grew by over 7 percent a year for nearly a decade. However, a considerable level of this growth has since been attributed to the redeployment of idle resources — both capital and labor — after the depths of the 1998 crisis. This process has been repeated since the 2008 crisis. As of October, Russia’s national unemployment rate stood at 5.3 percent, a post-Soviet record. Therefore, superior growth outlook for Russia can rely significantly on an increase in productivity by Russia’s relatively strong employment level. This has been one of President Vladimir Putin’s key arguments since his inauguration in May. However, an increase in productivity growth will require a major expansion and upgrade of Russia’s capital stock. One of Putin’s first acts as president was to sign a decree to increase the investment-to-G.D.P. ratio from 20 percent in 2011 to 25 percent in 2015 and to 27 percent in 2018. This decree and other public statements since are clear declarations that in order to attain this goal a radical enhancement of Russia’s investment climate is urgently required. It is the government’s aim to deliver the first tangible results of this sentiment in 2013, which in many ways will determine the structural growth outlook and the nature of Russia’s next business cycle. In fact, the government can take credit for some notable achievements in 2012 that have helped pave the way for a more modern economy. These include the institutionalization of the budget rule, which requires the federal budget to balance at the 10 year average of oil prices; the long-overdue creation of the Central Depository; a government decree requiring state-owned companies to pay a 25 percent dividend; and continued progress on the privatization of state companies. These are all commendable steps along the designated path of modernization. That said, it is yet to be seen if the momentum behind these efforts is unstoppable. Until these measures are fully realized, it may seem possible, yet elusive, for a more optimistic 5–6 percent growth objective to remain on the other side of the proverbial dark glass. Alexei Zabotkin is head of investment strategy at V.T.B. Capital.